Now that it’s almost fall, I have been on a fall drink kick. Never mind the fact that it’s still hot here in San Diego! This warm weather is not stopping me from my Starbucks caramel apple spice, salted caramel frappuccino, or any of the other yummy drinks that Starbucks has to offer! 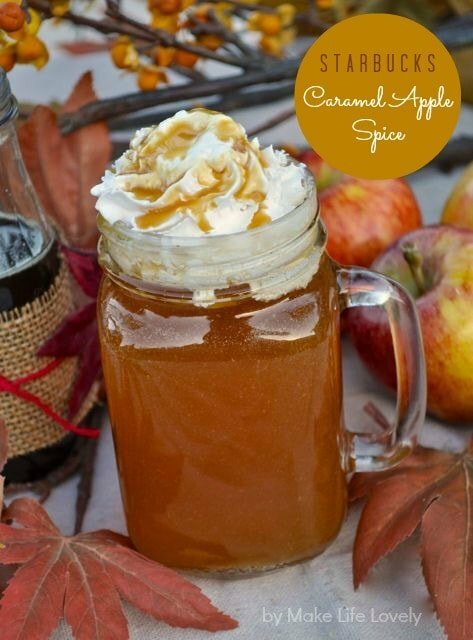 I figured it was time I tried making my favorite caramel apple spice drink at home. I found the actual caramel apple spice Starbucks recipe here and adapted it a bit. The recipe calls for Starbucks Cinnamon Dolce Syrup, which I didn’t have. I didn’t want to go buy the syrup at Starbucks for $12 a bottle so I tried making my own cinnamon dolce syrup. My version of the Starbucks Cinnamon Dolce Syrup tastes amazing! It also cost me zero dollars to make, since I already had all of the ingredients. Can’t beat that! 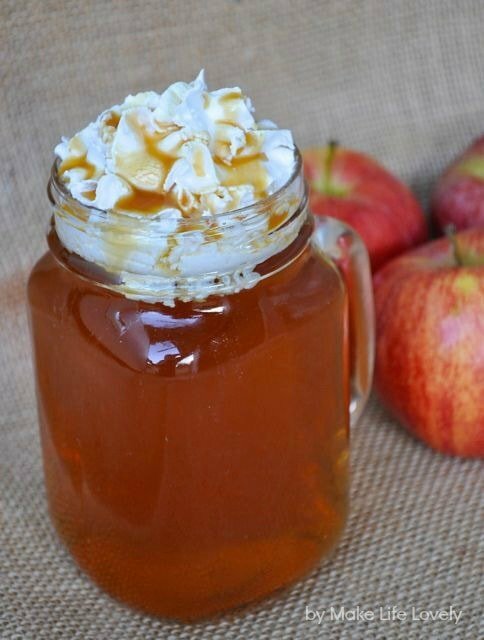 Wanna’ make your own Starbucks caramel apple spice at home too? Apple juice (Starbucks uses Tree Top, so that’s what I used), around 12 oz. Add 3 Tbsp. syrup to the apple juice in a microwavable cup. Microwave until very warm, between 1-2 minutes. Add whip cream to the top, drizzle with caramel syrup, and enjoy!! 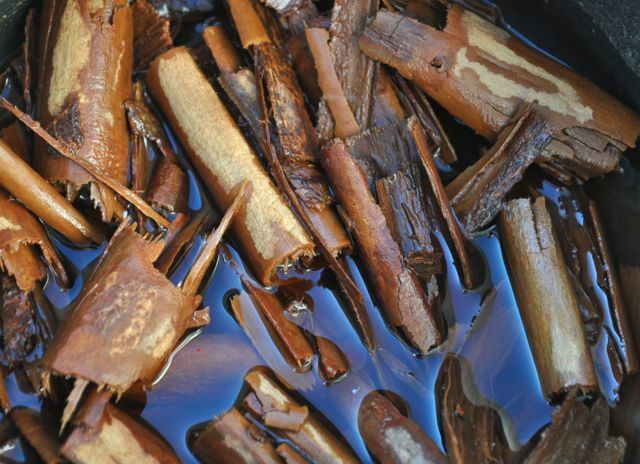 Break cinnamon sticks into smaller pieces, and add to water in a small pot. Bring to a boil, and lower heat to a simmer. Simmer the sticks and water for about 10-15 minutes. Once syrup has cooled, remove the sticks and discard. 2. Add brown sugar to the cinnamon water mixture, and heat on low. Stir until brown sugar is dissolved. Let cool, and refrigerate in a sealed container until ready to use. I hope you enjoy this yummy Starbucks caramel apple spice recipe as much as we did! 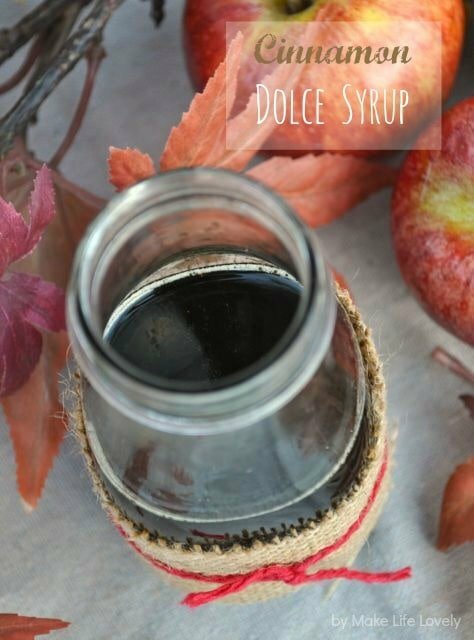 You will be able to make a lot of these with a container of apple juice, and save yourself the money, time, and hassle it would take to go to Starbucks to get your own! Well that sounds yummy! I’ve pinned your recipe and I’m already trying to decide which girl friend to have over for “coffee”. I’m pregnant right now so I’m not having any of the fun seasonal coffee drinks but this sounds even better! I’m stopping by from Link Party Palooza (#117 Caramelized Pear & Spiced Crumb Heaven). Thanks for stopping by Lauen! This is a good alternative to coffee drinks, especially for a pregnant lady. Good luck with your pregnancy!